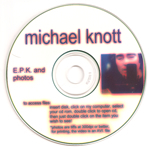 Michael Knott – Life of David E.P.K. This CD-R was released as the Electronic Press Kit (E.P.K.) for Life of David. It contains a video that show Michael talking about the album and recording it in the studio. It also comes with 7 high-quality promo images from the Life of David album.